First and Last Holiday-Blog-Post. Day 3 and a Cutback. wurde am um 22:54 Uhr unter 4kubik, wearenot(only)sisi veröffentlicht. First and Last Holiday-Blog-Post. Day 3 and a Cutback. Previously on WeAreNotSisi: We did some computer work and began to think about the „We“ that we are forced to be for this project. It is important but at the same time such a boring and mind-stultifying work to think about those generalisations, clichees and random attributions, so we postponed to think about that further for now and concentrated on the more essential stuff. But surely the „Austrian“ will be back at some point. 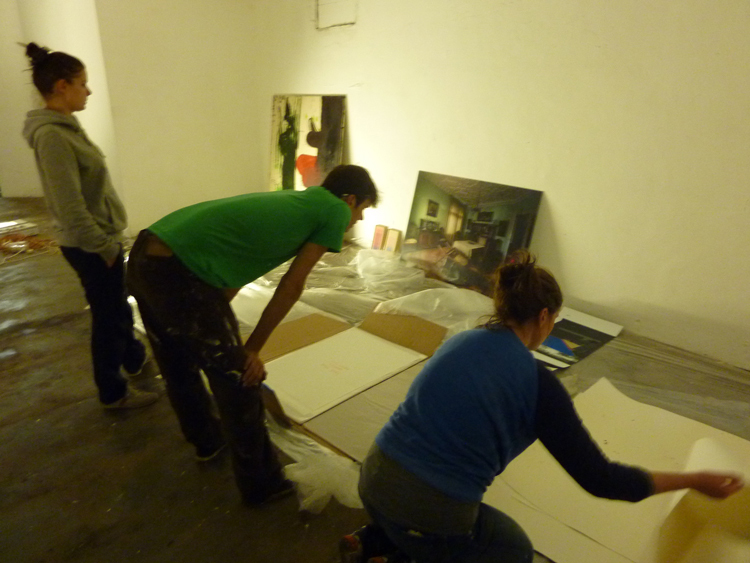 In the evening the first artists arrived from Vienna in Amsterdam – Micha Wille, Catharina Bond & Garacek. Let’s take an important view cut-back at this moment. Unpacking the art? Which art? And how did it get there? This brings us back to September 12, 2014. We got up early, still holding on to the idea that we would go „wildplakken“ every morning. 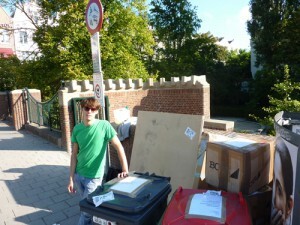 While the rest is packed in plastic and running through the city we would put our dirtiest clothes on to plak the city. 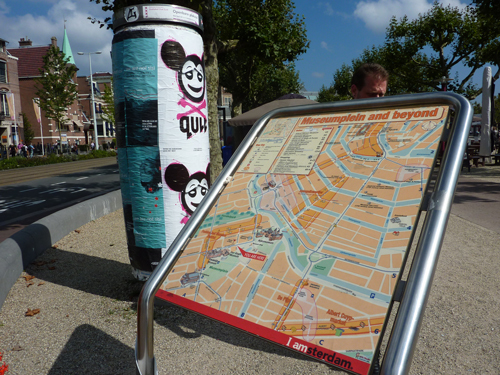 We learned at the Ijzerwinkel that there is posteroorlog out there and indeed – even the wildplakzuilen were wrapped in commercial advertisement from the multinationals which decided to flood the city with their messages. Thats why we wanted to be out there every morning to strike back. Well, we didn’t but at least we gave it this one shot. While we were filling our jerrycan with best Amsterdammer Grachtenwater from the Singel next to the Munttoren and mixed it with the glue, I received a call that „in 15 minutes“ the art will be unloaded on the Vondelbrug – the bridge in which we were about to spend the next couple of weeks. So we raced through the city, arrived exactly when the guy with his overfull transporter arrived and minutes later the art was on the bridge. I did not have a key for the bunker yet, but there was the most splendid summer-morning-sun that dried our sweat and made it acceptable to wait for something to happen so we could actually go into the bunker. Well, Sam Heady and Martin were both preparing the first show of Sin Sin Collectives’ Jarry Unchained as part of the FreeFringeFestival so we were able to get in and store the stuff. Lucky Bastards we are. Meanwhile Freiherr von Wrede arrived to start the wildplak-action with a few hours delay. We made a very small round out of the park, over the Museumplein and back via the Stedelijk Museum into the bunker. It was fabulous even though we knew the next morning the multis will have overplakked us without any mercy. But we do strongly believe: „De plakplaatsen zijn alleen beschikbaar voor niet-commerciële aankondigingen en vrije meningsuiting.“ Duidelijk?